With a few free days midweek, I headed to Yosemite to do some hikes in the area that have been on my radar for a few years. 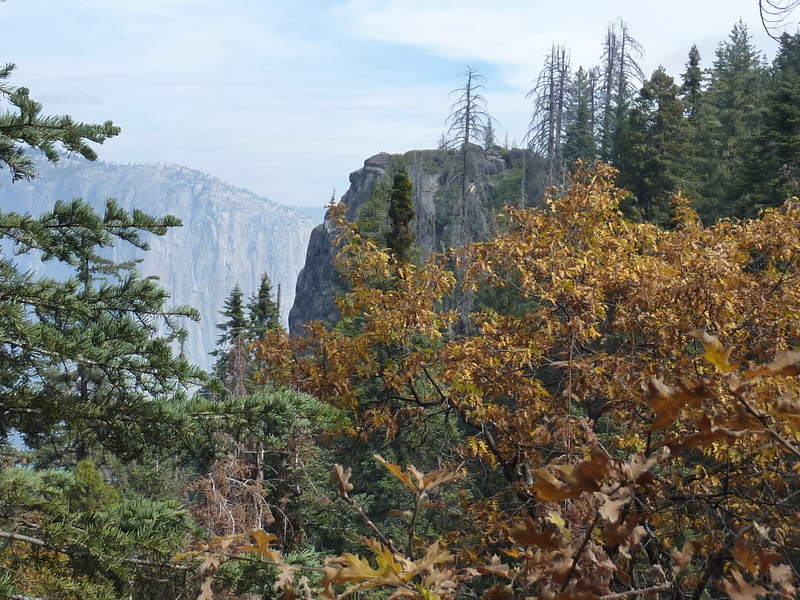 Some years back I had done a hike with friends along the south rim of Yosemite Valley, climbing Leaning Tower and tagging a number of points along the trail as it winds its way west to Tunnel View. We had bypassed Old Inspiration Point since it looked to be a bit of a bushwhack and we were all pretty tired by the time we went by it. After leaving San Jose around 7a, I had half a day by the time I got to the Valley, which seemed about right to tag this one from Tunnel View along with a few other minor points that had so far been neglected. As I started out at 11:20a, the first thing one can't miss was the heavy smoke filling much of the Valley. This didn't deter me from visiting spots named Inspiration Point for unispirational views and likewise didn't stop the hordes of visitors from stopping at Tunnel View, piling out and snapping selfies and group photos with the smoke in place of where El Cap, Leaning Tower, Bridalveil Fall, Three Brothers and Cathedral Rocks would normally be seen. I guess if you put enough into planning a vacation it will take a lot more than smoke to ruin your scenic photo ops. Not surprisingly, I was the only one on the Inspiration Point Trail. I guess you can still snap photos with no views, but most folks aren't willing to extend that to include a hike. Old Inspiration Point is about 3mi from the TH with the newer version a little more than mile away. I stopped at the latter first, finding it as dull as one would expect given the conditions, but I was surprised that the view isn't all that great anyway, with trees partially blocking views towards El Capitan. The only sign I saw for the point was 0.6mi from it at a junction, but there is no sign to tell you when you've arrived (I had to get that from my GPSr). Not so great, this one. I continued up the trail through the changing forest colors until I was about a quarter mile from Old Inspiration Point. I was happy to find a use trail at an unmarked junction (some sticks block the path to keep folks from wandering there accidently) that took me all the way to the point, including some nicely groomed manzanita that would have been tough to bushwhack through. If I had known it was this easy (less than 10min from the maintained trail) I would have been easily able to talk the others into the side visit on that earlier trip. Someone on PB had commented that the view from the newer Inspiration Point is better than that from Old Inspiration but that simply isn't true. Where the newer point has only partial views, Old Inspiration lies at the end of a rock outcrop overlooking the Merced River drainage in spectacular style, with great views both upstream and downstream. I suspect this person hadn't actually hiked out to this point at 6,500ft. Upon returning to the trail, I went back down about a mile before striking off cross-country for Turtleback Dome. I was worried about running into poison oak since Turtleback is just over 5,000ft and Elephant Rock another 500ft lower, but was happy to not find any of it. The going started out initially a little rough with a lot of downfall along the line I was traversing, but I soon found myself on an old paved road, decades in disuse, probably the old road before the tunnel on SR41 was constructed. I followed this a short distance before leaving it when it turned northeast and walked down some nice slabs with a view of the highway below. After more traversing through the forest I stumbled upon yet another use trail that took me nicely to Turtleback Dome from the backside (partially following along a poorly buried high-voltage cable). The top is crowned with several communication towers with a road coming up from the highway. There were a pair of workers building something as I approached and I quietly stayed out of view before finding my way to the summit rocks a little further on. There are several rocks vying for the highpoint, but I judged a class 3 one standing apart from the others to the west to be the highest. The views here were nothing special because trees block much of the view. I descended the west side on low angle granite slabs to reach the highway in about 10min. I crossed the road and headed for Elephant Rock about a quarter mile further west. This one, too, has a very good use trail that I didn't find until I was half way to the "summit". It's more of a rock outcrop perched on the edge of the Merced Gorge, but it has very nice views (aside from today's smoke) and an impressive, overhanging rock perched over a fair bit of vertical drop. After returning to the highway it was a matter of walking the road back to Tunnel View, made a little tricky by controlled traffic for construction. One side of the tunnel has a sidewalk to allow pedestrians to avoid getting run over. There are a couple of side tunnels going out to the gorge, a one of which I explored (they used these to dump material out of during the tunnel excavation). It was 3p by the time I returned, taking something less than 4hrs for the roundtrip effort. I showered at Half Dome Village before heading out of the Valley to find a place to sleep for the night. Only I didn't get so far as I found myself in (mostly) stop and (little) go traffic, taking an hour to get between Half Dome Village and Yosemite Village, a distance of maybe a mile. Seems they were redoing the northside pavement and with no real traffic management it was left to develop into a complete mess. I guess they saved the roadwork for midweek when there's less traffic. Argh.